Monster Boy And the Cursed Kingdom is a game that will catch your attention if you are a fan of classic action adventure games. 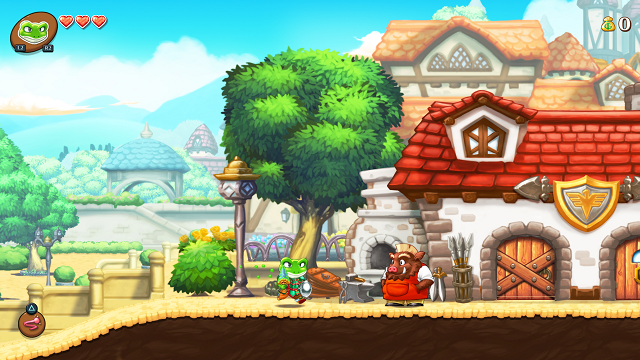 Game Atelier is aiming to bring back the spirit of the classic Wonder Boy/Monster World series with cooperation from original series creator Ryuichi Nishizawa in Monster Boy. This particular game is one that definitely caught me off guard, since I wasn’t really expecting to see this series make as grand of a return as this. For those of you who are unfamiliar, this is a series of side-scrolling action adventure games not unlike Zelda II: The Adventure of Link. You explore various areas, jump on platforms and attack some rather adorable monsters for some cash to be spent on better equipment. After playing Monster Boy, I am happy to report that this game seems to be shaping up to be a nice love letter to the old series. 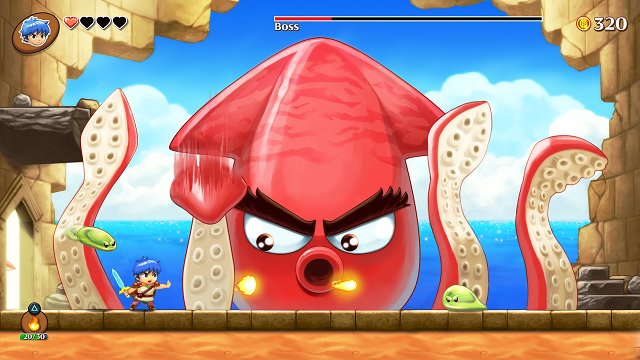 Like the older games, Monster Boy has you hacking and slashing enemies in areas such as beaches or dungeons. Your character controls perfectly and none of the jumps felt too tricky to make. Even though your sword range is fairly limited, I never felt that getting up close to an enemy was a risk, even though some of the later enemies can actually pack quite the punch. Your character also gets some magic which can be used to either solve puzzles or attack enemies from a distance, which is nice. When I reached the boss I really got a sense for just how gorgeous the game is. The colors are bright and really pop out of the screen and the character animations bring them to life, creating a world that feels a lot more alive than many other games in the genre. These screenshots really do not do it justice, you have to see this in action for yourself! Of course, Monster Boy wouldn’t be complete if it did not have monster transformations. You gain the ability to turn into various monsters such as a pig, which will look familiar to long time fans, a snake and a frog, among others. They all have their own unique abilities to help you get through some of the puzzles, such as the pig’s sense of smell to discover hidden goodies, the snake’s ability to crawl on walls and ceilings or the frog’s tongue which can be used to swing off of certain ledges. 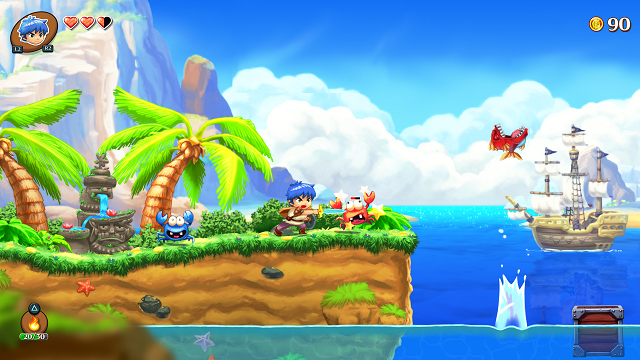 Monster Boy is said to be a ‘Dream come true’ project and I can definitely see that. It’s clear the developers were big fans of the Wonder Boy/Monster World series and want to recapture and refine what was accomplished back then to bring it to a whole new audience. Be sure to check out Monster Boy when it releases later this year for Nintendo Switch, PlayStation 4, Steam and Xbox One.